Colleen Lewis and Taofeek Owonikoko confer with T. Kearney in the Phase I Clinical Trials Unit at Winship Cancer Institute. Lewis is the lead nurse practitioner in the unit. On occasion, Colleen Lewis, a 2008 graduate of the Nell Hodgson Woodruff School of Nursing, administers a new drug to a hopeful patient for the very first time. The drugs are always experimental and as of yet unapproved by the U.S. Food and Drug Administration. The treatments may or may not work. Yet day after day, Lewis's patients offer up their time for clinical trials, hoping that research results may benefit themselves or others dealing with cancer. 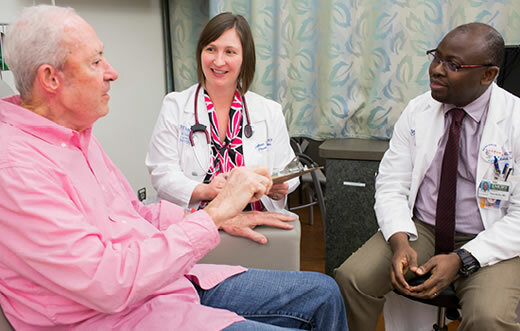 "These patients are some of the most generous people I've ever met," says Lewis, lead nurse practitioner in the Phase I Clinical Trials Unit at Winship Cancer Institute. "Even when they're dealing with a difficult diagnosis, they're asking how they can give back and help others." Lewis came to the job after graduating from Emory's School of Nursing, just as plans for the Phase I Unit were being developed. As lead nurse practitioner, Lewis supervises patient care and safety at the unit, while serving as a co-investigator on more than 50 research trials. She collaborates daily with physicians, pharmacists, advanced practice providers, nurses, and Emory ethicists to ensure meticulous research protocols and conscientious clinical care. "Everyone here has special training to not only provide excellent patient care but to also pay extraordinary attention to data collection," she says. "It's important to us to get everything right so the patients' time in clinical trials is meaningful." Lewis had an early start in the oncology field. "My mom's an oncology nurse in Florida," she explains. "As a kid, I would help volunteer at events such as Celebration of Life." Later on, Lewis spent summers working in her mom's hospital and was inspired by the oncology staff's passion and commitment. "Seeing the dedication of my mom and other people around her really drew me into the field," says Lewis. "For me, it's important to come to work not just to do a job but to serve a purpose. I wanted to know everyday when I came into work that I was making an effort to serve others." In recognition of her dedication and service, Lewis is a past recipient of the Katie Ferraris Taylor Oncology Nursing Fund Award for continuing education. She used her scholarship to become an Adult Oncology Certified Nurse Practitioner. Lewis was among the nurses who cared for Taylor, who died of a rare form of leukemia in 2007. At the Phase I Clinical Trials Unit, Lewis oversaw early immunotherapy research and then watched it evolve into a mainstream and effective cancer treatment. "We see better responses and better quality of life for some patients, so really it's a best-case scenario," she says. "It's a reminder that while we have a lot of work to do to advance cancer research, we have made a lot of progress in the past few years." While many patients have exhausted standard treatment options by the time Lewis meets them, she focuses on what she can provide to them. "For me, it's an honor to be part of their journey. Their disappointments motivate me to work harder every day. Even if the outcome is not what we want, I can be here to help manage their pain, focus on their quality of life, and ensure they have a pleasant experience while they're here with us."